Dr. Sutton's Burrowing Owl becomes NOU's "mascot bird"
Trying to summarize the history of a century of ornithology, by a person who has witnessed only the last forty years of it, is perhaps as difficult as it is to describe an elephant when only its retreating rear end has been seen. Misinterpretation as well as an emphasis on the better-known and closer portions are likely to occur. Furthermore, besides being a necessarily myopic view, the following account has a distinctly personal touch, inasmuch as I have seen Nebraska only through my own eyes and experiences. Yet, we have good documentations of the activities of ornithologists at the turn of the last century through the earliest publications of the Nebraska Ornithologists' Union, and these have helped to let me see the front of the elephant with some clarity. I hope others might agree. In 1894 Dr. Isadore S. Trostler of Omaha sent a notice to the magazine Oologist, asking that all persons interested in Nebraska ornithology and oology might submit their names and addresses to him. From this effort he received about ten replies. He tried to arrange a meeting with these persons with a view to forming a state organization devoted to birds, but failed. He tried again in 1895 and 1896, and failed both years. Again in 1898 he tried to organize a meeting in conjuction with the Trans-Mississippi Exposition, but only managed to visit with a few of his now nearly 25 contacts when they visited the exposition. Finally, in May, 1899, he arranged a preliminary organizational meeting with five others. These people were mostly from the Omaha area, but also included M. A. Carriker, Jr. of Nebraska City. They decided their group should be called the Nebraska Ornithologists' Association. They soon learned that only about three months previously Dr. Robert H. Wolcott and Dr. Lawrence Bruner, both well-known biologists of the University of Nebraska, had organized a Nebraska Ornithological Club in Lincoln. The Omaha group thus petitioned the Lincoln group to open their membership to the entire state. As a result, in May of 1899 a committee of the Lincoln club sent out letters around the state, inviting interested persons to join their group. On July 15, 1899, the first meeting was held for the election of officers, with 43 persons attending. The first annual meeting finally occurred in Lincoln, on Dec. 16, 1899. At that time the constitution of the Nebraska Ornithologists' Union was ratified, with more than 90 active and associate charter members. The first president of the N.O.U. was Dr. Lawrence Bruner, with I.S. Trostler serving as vice-president. The second annual meeting was held in Omaha, on January 12, 1901, with I.S. Trostler now president, and with 64 active members as well as 36 associates and four honorary members. Included in the charter membership rolls were such outstanding scientific luminaries as Dr. E.H. Barbour, Professor of Geology and internationally known paleontologist, Dr. Frederick E. Clements, Professor of Botany and one of the pioneers of American plant ecology, Dr. Lawrence Bruner, Professor of Entomology and also already an authority on Nebraska's birds, and Dr. Henry B. Ward, Professor of Zoology and nationally-known parasitologist and invertebrate zoologist, all of the University of Nebraska. Among 21 papers presented at the second annual meeting, Professor Lawrence Bruner summarized information on the bird species known to be nesting in Nebraska, which totaled 185 species. Another 39 species were listed as undoubtedly breeding, but evidence was lacking. Many of the species listed as then "known" to nest in the state, such as both yellowlegs, are now known not to be breeders. M.A. Carriker, Jr., later to become famous as a collector of tropical birds in Central and South America for several national museums, also presented two papers. The third annual meeting was held in Lincoln, in February of 1902, with Prof. Barbour presiding. He presented a long and excellent paper (32 published pages) on the probable reptilian ancestry of birds, based on the fossil record. He included several excellent reconstructions of Archaeopteryx, and a phyletic diagram suggesting that theropod dinosaurs provided the ancestral origin of birds. Prof. R.H. Wolcott offered an historical review of ornithology in Nebraska, mainly comprised of an extensive bibliography, Lawrence Bruner described the birds of the eastern Sandhills, and Myron Swenk offered a paper on wintering birds of Nebraska. Myron Swenk, a charter member while still a high school student, was subsequently destined to follow Dr. Bruner as a University of Nebraska Professor of Entomology and spiritual leader of the N.O.U. for many decades. John T. Zimmer was only ten years old when the N.O.U. was formed, but late while at the University of Nebraska he too came under the influence of Dr. Bruner, and went on to become one of Nebraska's most famous ornithologists, winning the Brewster medal (the highest award of the American Ornithologists' Union) in 1952. Working at both the Field Museum and the American Museum of Natural History, he authored a valuable bibliography of the Field Museum's ornithological library, and was a contributing author to the monumental Catalogue of the Birds of the Americas and also to J.L. Peters' Check-list of the Birdsof the World. The triad of Bruner, Wolcott and Swenk published "A Preliminary Review of the Birds of Nebraska" in 1904, complete with identification keys and documentations of occurrence for every species reported from the state. Earlier, in 1896, Lawrence Bruner had published (in the Annual Report of the State Horticultural Society) the first complete checklist of Nebraska birds, totaling (again, in the taxonomy of the day), some 415 forms (species and subspecies), and 225 breeding forms. Viewed in terms of modern taxonomy, the list included some 350 species. During the early years of the N.O.U., the Proceedings were produced annually through 1902. From 1908 to 1915 the annual meeting's proceedings were also published (as three additional volumes), but there was still no journal for the N.O.U. By the time of the 16th annual meeting in 1915, finances or other considertions had seemingly made it impractical to continue publishing the N.O.U. 's annual proceedings, and their separate publication was terminated. Instead, the N.O.U. decided to become an auxiliary of the Wilson Ornithological Club, with shared membership dues. This arrangement lasted for nine years, until 1924. Starting in 1925, a mimeographed "Letter of Information" was periodically mailed to members, with 68 issues written by the end of 1932, most if not all being written by Myron Swenk. Apparently only two intact sets of these still exist, which are in the files of the N.O.U. library at the State Museum of the University of Nebraska and in the Special Collections of the university archives in Love Library. The official journal of the N.O.U., The Nebraska Bird Review, began publication with the January, 1933 issue. On its cover was a drawing of a Burrowing Owl by John L. Ridgway, brother of the well known ornithologist Robert Ridgway. The choice of this species as a logo seemed appropriate, since the type specimen of the North American subspecies had been collected near the Platte River of Nebraska during the Long Expedition of 1820. At that time Myron Swenk was editor, and a list of the prior publications of the N.O.U. was included with the first issue. These consisted of six volumes of the Proceedings of the N.O.U. from 1900-1915, a field checklist of Nebraska birds (dated 1908), the nine years of annual meeting proceedings that had been published in the Wilson Bulletin (1916-1924) and the Letter of Information series (1925-1932). By the late 1930s, there were more than 120 active members of the N.O.U., with three charter members (A.L. Haeker, M.H. Swenk, and Wilson Tout) still active. Since 1925 annual summaries of spring and fall bird migration records have been published, first in the Letter of Information series and later in the Review, providing an extremely valuable and long-term record of seasonal changes in Nebraska bird populations. With the start of the 1938 volume a new cover sketch, by George Sutton, was introduced. Dr. Sutton had been born in the Bethany area of Lincoln but the family left while he was still a child. This fine drawing has served as a logo for the N.O.U. ever since, except for a brief period when a sketch by the then editor Dr. Henry Baumgarten was used instead. In 1941 Myron Swenk died, after having served the N.O.U. long and well. Not only had he served as its president (1907-1908), but also as secretary or secretary-treasurer from 1904 to 1937, as the editor of the Proceedings for many years, as writer of the Letters of Information, and as editor of the Nebraska Bird Review from its beginnings throughout the 1930s. He also served as president of the Wilson Ornithological Club in 1918-1919. He published over 70 ornithological papers in his career, plus many others in entomology and mammalogy. His collection of several thousand bird and mammal specimens, and an insect collection of more than 142 type specimens, was given to the University after his death. The first issue of the 1942 volume was a special memorial issue devoted to Dr. Swenk and his lifelong devotion to the N.O.U. Through 1942 annual meetings had been held in many cities of the state, with Lincoln serving as host most often (17 times), followed by Omaha (10 times). By then there were some 140 N.O.U. members and there were active bird (or nature) clubs in Lincoln, Omaha, North Platte, Superior, Hastings, Fairbury and Chadron. Eventually the N.O.U. became an Affiliated Society of the Nebraska Academy of Science, and for a few years had a separate papers session during that group's annual meeting. For a time there was also a mid-winter NOU meeting for the purpose of presenting papers. In 1945 an annotated check-list of the birds of Nebraska was produced by the N.O.U., and was published in the Review. It was jointly written by F.W. Haeker, Dr. R. Allyn Moser, and Jane B. (Mrs. Myron) Swenk. In 1958 a revised version of this list was produced by Dr. William F. Rapp, Jr., Mrs. Janet L.C. Rapp, Dr. Henry E. Baumgarten and Dr. R. Allyn Moser. The list included four hypothetical species plus 393 accepted species of which 218 were judged to be breeders. It was reprinted unchanged, but with a short supplement by Dr. R. ("Rusty") G. Cortelyou and Kent L. Fiala, in 1970. Dr. Cortelyou served as a long-term editor of the Review, from 1965 to 1990, and Kent Fiala also produced (1970) a checklist of the birds of Gage County while still an undergraduate student at the University of Nebraska. The mid-1950s was a time of great interest in Platte Valley birds by nationally known ornithologists. Prof. Charles Sibley of Cornell University led his students on a series of summer collecting expeditions to central Nebraska, studying breeding biology and collecting specimens of several East-West species-pairs of birds that hybridize extensively in that valley. These studies proved the importance of the Platte Valley, and to a lesser extent the Niobrara Valley, as dispersion corridors and major evolutionary "suture zones" between eastern and western avifaunas. Their fingings spurred a revision in our taxonomic interpretations of such hybridizing birds as the Yellow-shafted and Red-shafted Flickers (=Northern Flicker), the Eastern and Spotted Towhees (=Rufous-sided Towhee), the Baltimore and Bullock's Orioles (=Northern Oriole), and several others. During that same period (1956-59) I attended at Cornell as a doctoral graduate student under Dr. Sibley, and listened in awe to the stories my graduate student friends told me of the beauty of Nebraska's Platte Valley in spring, and of its wonderful bird life. Little wonder that, when I learned of a job opening for an ornithologist at the University of Nebraska during 1961 while doing postdoctoral study in England, I wasted no time in applying for the position. I had never set foot in Nebraska at that time, but was certain that I would love the state. I also knew that Nebraska's Sandhills were a major waterfowl breeding region, but was unaware of another great ornithological attraction of Nebraska, its amazing Sandhill Crane migration. I moved to Lincoln in the fall of 1961, and soon joined the N.O.U. However, my early interests during that period primarily concerned the biology and behavior of world bird groups, especially waterfowl. I first attended and spoke at a N.O.U. meeting in 1963, when I met some of the state's most active bird-enthusiasts, such as Doris Gates of Chadron and Mr. and Mrs. John Lueschen of Wisner. Doris Gates was then editor of the Review, and served as such from 1955 to 1965, when Rusty Cortelyou assumed the role. Some others who served long periods as editor of the Review included Dr. William F. Rapp, Jr., serving from 1948-1955, and Dr. Rosalind Morris, editor from 1992 to 1998. Dr. Neva Pruess served as librarian from 1979-1988. Dr. Mary Lou Pritchard has served the N.O.U. in various capacities, most recently as librarian and custodian of N.O.U. papers and records. Lastly, Ruth C. Green has served the N.O.U. in several roles over the years including the presidency (1979-1981, 1982-1984), and has inspired a whole generation of bird-banders and bird-enthusiasts. An interesting account of early bird-banding activities in Nebraska was provided by H. Weakly in the July-December, 1939, issue of the Review. After the death of Mrs. Willetta ("Willie") Lueschen, who was also an active bird-bander, her husband donated her entire extensive ornithology library to the City of Norfolk, and it became a special wing of the Elkorn Valley Historical Museum (The Willetta Lueschen Library) in 1997. The N.O.U. library is now located with the vertebrate collections at the State Museum at Lincoln, and includes many rare items, including many specialized monographs, more than forty state or regional journals and several hundred books. I used it extensively during my research on the breeding birds of the Great Plains, as it contains many state journals not otherwise available in Lincoln. It has recently (1998) been computer-inventoried and documented by Neal Ratzlaff and Dr. Mary Lou Pritchard. I perhaps paid too little attention to the birds of Nebraska until I began work on my Breeding Birds of the Great Plains in the late 1970s. At that time I decided that a new checklist of the birds of Nebraska was badly needed, so I wrote "A Revised Checklist of the Birds of Nebraska and Adjacent States" in 1980, after having prepared a preliminary account earlier that year. This list was initially published as No. 6 in the series titled "Occasional Papers of the Nebraska Ornithologists' Union," and subsequently has been revised and reprinted many times through the 1990s. I also published an annotated list of the breeding birds of Nebraska in the Nebraska Bird Review in 1979, and a two-part paper on migration schedules of Nebraska passerine and non-passerine birds in 1980. The last 20 or so years of the N.O.U. membership have been marked by a greatly increased number of "hard-core" birders. Their enthusiasm has resulted in the addition of many new rare or accidental species to the Nebraska bird list, which now totals about 430 species. The N.O.U. Records Committee was formed in 1986, and an Official List of Nebraska's birds now exists, with periodic updates. A newsletter to N.O.U. members was begun in 1979 and by 1998 the membership list had reached about 230 active members. There are now many more professional ornithologists on the scene than when I first arrived, mostly working for state and federal agencies such as the Fish & Wildlife Service, Nebraska Game and Parks Commission, public and private universities and colleges, the Audubon Society, the Nature Conservancy and various municipal or private nature centers. A Nebraska Breeding Bird Survey that was organized by the N.O.U. in the 1980s has recently been completed and edited for 1999 publication by Wayne J. Mollhoff. Half-century sequences of Christmas bird counts have been attained for Lincoln, Scottsbluff and Omaha, and there are also fairly long albeit interrupted sequences for Grand Island, Sioux City, Norfolk, and Crete. Gary Lingle, a past president of the N.O.U. (1983-86), has produced a bird-finding guidebook for the Platte Valley (Birding Crane River: Nebraska's Platte). The birds of the Platte Valley and of the Nebraska Sandhills have also been separately documented in books (1984, 1995) by me. 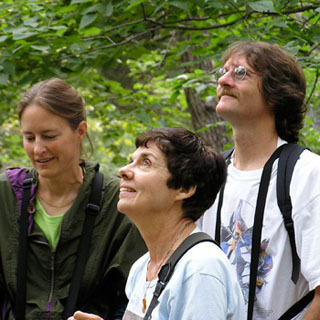 A booklet, "The birds of Nebraska: A critically evaluated list", was published in 1986 by Tanya Bray, Barbara K. Padelford and W. Ross Silcock. A book on the breeding birds of Nebraska (Nebraska Birds: Breeding Status and Distribution) was published in 1988 by James E. Ducey, and a more comprehensive state bird book is being done by W. Ross Silcock, Joel Jorgenson, and Roger Sharpe. There is now even a N.O.U. website on the Internet for reporting bird sightings, discussing Nebraska birds and exchanging N.O.U. news. Avian changes in Nebraska have also been great during this century. At the time the N.O.U. was formed the Eskimo Curlew was still a common migrant, and the Passenger Pigeon was still to be seen in small migrating flocks. Yet, the Carolina Parakeet was by then probably already extirpated, and the Wild Turkey and Ruffed Grouse had probably also virtually disappeared. The Swallow-tailed Kite, Bald Eagle, Osprey, Trumpeter Swan, Greater Sandhill Crane and Pileated Woodpecker were probably also gone as breeding birds by then as well. Several warblers (Blue-winged, Prairie, Northern Waterthrush) also disappeared around the turn of the century as breeders, as well as the Sage Grouse, Northern Saw-whet Owl, Yellow-bellied Sapsucker, and Baird's Sparrow. The Red-shouldered Hawk was probably never common or widespread as a Nebraska breeder, but was also barely hanging on by then. One of the last Eskimo Curlews to be collected in North America was shot near Hastings, in April of 1915; it had once been avidly hunted by market hunters. The Greater Prairie-chicken peaked and then began a gradual decline as natural grasslands increasingly gave way to croplands. The Lesser Prairie-chicken disappeared from Nebraska in the 1920s or 1930s, but actual breeding in the state was never documented. The House Sparrow was already well established in Nebraska by 1904, having been introduced into the U.S. in the early 1850s and arriving in Nebraska in the 1870s through releases by farmers who vainly hoped it might help control the locust plagues. The Rock Dove arrived in North America with the earliest settlers of the 1600s, but records of its first Nebraska appearance are lacking. The Ring-necked Pheasant was successfully introduced in 1909, and Wild Turkey was reintroduced in the early 1960s. Gray Partridge introductions were only marginally successful in northern Nebraska, and several other game bird introduction attempts (Chukar Partridge, Scaled Quail, Crested Tinamou) were failures. The European Starling would not appear in eastern Nebraska until, 1930, about 60 years after it was released in New York City. The House Finch in eastern Nebraska until the 1980s, some forty years after also having been released in New York. However, it was present in western Nebraska at least as early as 1919, and has slowly progressed eastwardly. Other recent self-introduced arrivals include the Cattle Egret in 1965, and the Great-tailed Grackle during the mid-1970s. The Trumpeter Swan resumed breeding in the northern Nebraska Sandhills in the late 1960s, as a result of reintroductions in nearby South Dakota. The Bald Eagle began nesting again in Nebraska during the 1980s, after recovering from the dismal DDT era. If provided with suitable nesting platforms, the Osprey would certainly also return. Eastern Bluebirds and Tree Swallows have likewise recently become fairly common in Nebraska, through bird house erection and monitoring programs. Aided by restoration efforts, Canada Geese have become commonplace breeders across the state, and Peregrine Falcons are also nesting locally again, through captive breeding and hacking programs. Under similar management efforts, Snow Geese, Sandhill Cranes, and Whooping Cranes have also flourished. The Chuck-wills-widow apparently had invaded extreme southeastern Nebraska from Kansas by 1965, and has now reached the lower Platte Valley, and the Wood Duck has gradually moved westward across the entire state over the last few decades. Breeding American Woodcocks have also moved west along the Platte Valley, to at least as far as Kearney. The growth of trees along our major waterways has improved foraging habitat and opportunities for east-west dispersal among not only these but many other woodland-dependent birds, while at the same time has reduced it for most water- and shoreline-dependent species. The construction of dams and resulting reservoirs has increased surface waters in the state, and has much affected wintering and migration patterns of fish-eaters or other water-dependent species, such as waterfowl, eagles, grebes and loons. Minimum flow rates for the Platte have been established, and many wetlands in the Rainwater Basin have come under protection, also helping water and shoreline birds. Milder winters have also allowed many migratory species that once rarely if ever wintered here to remain during milder years, at least in small numbers. Since the 1970s several species have been identified as threatened or endangered either statewide or nationally, such as Least Terns, Piping Plovers and Whooping Cranes, and efforts are underway to preserve them. As a result several new refuges or nature sanctuaries have been established, including two important migratory stopover sites for Sandhill and Whooping Cranes along the Platte River. At the same time many of our most spectacular grassland-dependent birds such as Burrowing Owl, Greater Prairie-chicken, Upland Sandpiper, and Long-billed Curlew have seriously declined, as have most of our grassland sparrows. Many Neotropical woodland-adapted migrants have also declined, whereas city-adapted and crop-dependent species such as Brown-headed Cowbird, Rock Dove, European Starling, American Crow as well as blackbirds and grackles have vastly increased and have sometimes become serious pests. The past century's most obvious bird gains (European Starling, House Sparrow, Rock Dove, House Finch, Cattle Egret, Great-tailed Grackle, Chuck-wills-widow, American Woodcock, Ring-necked Pheasant), when balanced against the three extinctions (Passenger Pigeon, Carolina Parakeet, Eskimo Curlew) and the many extirpations of our breeding species (Ruffed Grouse, American Swallow-tailed Kite, Greater Sandhill Crane, Pileated Woodpecker, Northern Saw-whet Owl, Yellow-bellied Sapsucker, three warblers, etc.) would seem to leave us both aesthetically and numerically poorer than we were at the turn of the century. Our logo-species, the Burrowing Owl, may well disappear from Nebraska in the next few decades, and our State Bird, the Western Meadowlark, is also in decline. Yet, skeins of Snow Geese still can etch a March Nebraska sky from dawn to dusk, Prairie-chickens still annually greet the spring sunrises with their ancestral rituals, and the spine-tingling cries of Sandhill Cranes coming to roost on the Platte still bring with them distant echoes of thundering bison, trumpeting mammoths, and even of times before recorded time. We can still totally lose ourselves in their grace and beauty, imagining that we have discovered some other Eden, and hopefully resolving to act in such a way that these birds might still be able to cast their marvelous spells just as strongly on our descendants a century hence as they do today.